Little Painley tumulus, near Gisburn, Lancs. OS grid reference: SD 8284 5012. 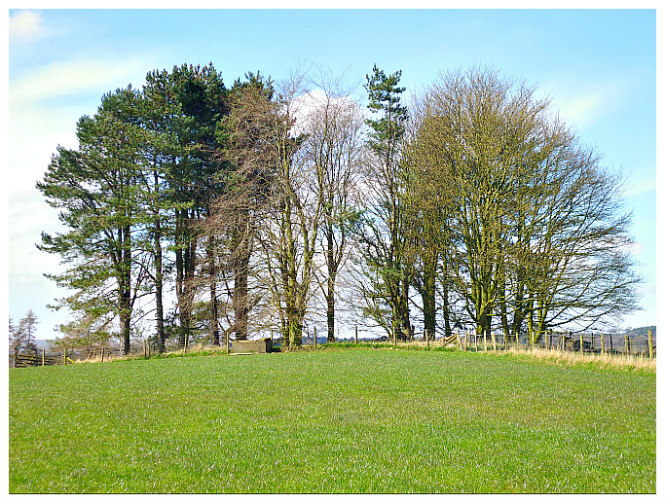 In the middle of a farmer’s field at Little Painley near Gisburn, Lancashire, there is a clump of tall trees which surround an ancient burial mound/bowl barrow. The very distinctive low mound is still quite prominent even after thousands of years. However it is now surrounded by a barbed-wire fence and also the site is more difficult to reach from the road due to a gate and recently erected fences, although as these fields are for the growing of crops and vegitables in the Summer months, I suppose that is to be expected. The burial mound (tumulus) is located on the left-hand side of the A682 (Long Preston) road 1¼ miles to the north of Gisburn church and just past ‘The Temple’, which is an 18th century tree-clad mound. Little Painley prehistoric burial mound is situated on private land and on a low hill surrounded by fields that have crops growing in them in the Summer months. So, if you do wish to take a closer look it is advisable to ‘keep’ to the fence-side of the field. Little Painley Burial Mound, near Gisburn, close-up. The barrow stands on a low hill at the eastern side of the River Ribble and is said to have a diameter of 20m (68 ft) and is maybe 2-3 feet high. It was built of earth and stones in the Bronze Age – sometime between 2,500-1,600 BC. There is a surrounding ditch 2.5m (6 ft) across and 0.5m (1 ft 6 inches) deep. 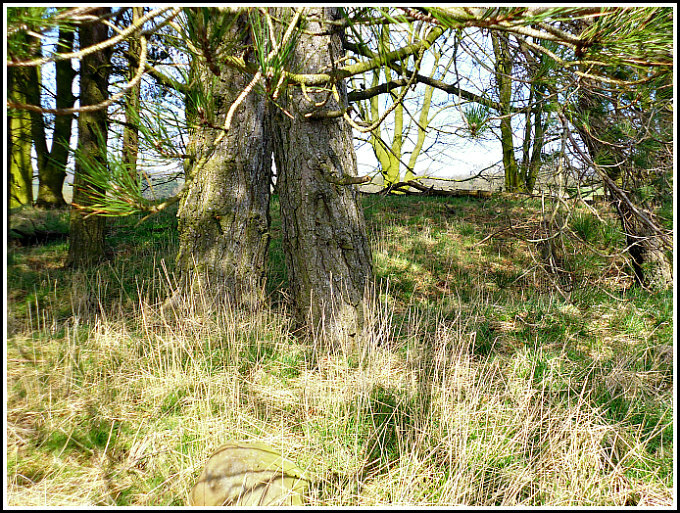 At the SW side there are traces of an outer bank some 2.5m (6 ft) in width and about 0.3m ( nearly 1 ft) high, although these features are often hard to see properly due to the trees, and in the Summer months – the long grass. The trees here were planted in the 1960s. When this barrow was excavated in the early 1900s one or more collared funery urns of the ‘Pennine type’ were found indicating that there was probably a settlement near by. The author John Dixon in his work ‘Journeys Through Brigantia’ (Volume One), suggests the settlement was centred on Bolton-by-Bowland, where a number of Bronze Age axe heads have been found. It is perhaps likely, then, that a chieftain and his close family were buried here at the Little Painley barrow. About ½ a mile to the north beside the River Ribble, just south of Paythorne bridge, stands Castle Haugh, a late 11th century earthwork consisting of a large ditched mound with a ‘motte’ at the centre. This stronghold was probably the residence of Roger the Poitevin, a Norman baron who held the lands around here. He is mentioned in ‘The Domesday Book’ (1086) under the entry for Bernulfeswick (Barnoldswick) in Craven. Dixon, John & Phillip, Journeys Through Brigantia (Volume One), Aussteiger Publications, Barnoldswick, 1990. Tylor, Edward B. (Sir), Anthropology (Vol II), Watts & Co., London, 1946. Categories: Burial Mound, Burial Mounds / Round Barrows | Tags: Little Painley Burial Mound near Gisburn in Lancashire | Permalink.